TAICHUNG. Just a couple of hours after shutting out Mexico 11-0, Japan returned to the field and delivered the same fate to Venezuela at Dou-Liou-Stadium on Monday evening. Tomohiro Anraku struck out 16 batters in nine two-hit innings to lead them to a 7-0 win. 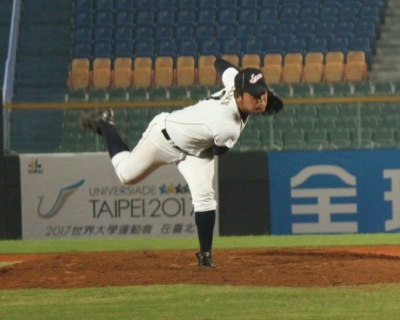 They improved to 3-0, while Venezuela dropped to 2-1 with its first loss of the XXVI 18U Baseball World Cup in Taichung. It was a demonstration by one of the best pitching prospects in Japanese baseball. Tomohiro Anraku mowed down the Venezuelan offense at will, issuing only a pair of singles to Jose Pina and Luis Silva in the second and the third through nine innings. A third base runner for Venezuela reached on an error. Otherwise the right-hander was perfect, striking out 16 batters in the process. Japan’s offense on the other hand didn’t waste any time to get on the board. Yuto Yoshida walked to lead off the first and came around to score on Tomoya Mori’s sac fly. One inning later Ryuma Mori drove in another run with a single. They added three more runs in the fifth and one each in the seventh and eighth to blow things open. Tomoya Mori drove in three runs total thanks to a pair of doubles. Satoshi Sonobe collected two RBI. Welmer Qunitero got charged with the loss, surrendering two hits, two runs (1 ER) and a walk in 1 2/3 innings. Ismael Zerpa and Maiyerson Echegaray also took the mound for Venezuela. Venezuela will face another tough opponent on Tuesday, taking on Chinese Taipei in the afternoon at Intercontinental Stadium. Japan hopes to remain its undefeated record in a matchup with the Czech Republic at Taichung City Stadium.